Save an extra CDN$ 15.33 (50%). Buy the Kindle Edition instead. Comment: All pages and cover are intact (including the dust cover, if applicable). Spine may show signs of wear. Pages may include limited notes and highlighting. May include "From the library of" labels. This book uncovers the biggest scientific fraud of our age. It tells the fascinating and frequently astounding story of how the massive enterprise to restructure the genetic core of the world's food supply came into being, how it advanced by consistently violating the protocols of science, and how for more than three decades, hundreds of eminent biologists and esteemed institutions have systematically contorted the truth in order to conceal the unique risks of its products–and get them onto our dinner plates. Altered Genes, Twisted Truth provides a graphic account of how this elaborate fraud was crafted and how it not only deceived the general public, but Bill Clinton, Bill Gates, Barack Obama and a host of other astute and influential individuals as well. The book also exposes how the U.S. Food and Drug Administration (FDA) was induced to become a key accomplice--and how it has broken the law and repeatedly lied in order to usher genetically engineered foods onto the market without the safety testing that's required by federal statute. As a result, for fifteen years America's families have been regularly ingesting a group of novel products that the FDA's own scientific staff had previously determined to be unduly hazardous to human health. Start reading ALTERED GENES, TWISTED TRUTH on your Kindle in under a minute. “Altered Genes, Twisted Truth is lucid, illuminating, and alarming. As a former New York City prosecutor, I was shocked to discover how the FDA illegally exempted GE foods from the rigorous testing mandated by federal statute. And as the mother of three young kids, I was outraged to learn how America’s children are being callously exposed to experimental foods that were deemed abnormally risky by the FDA’s own experts.”--Tara-Cook Littman, J.D. Steven M. Druker is a public interest attorney who, as executive director of the Alliance for Bio-Integrity, initiated a lawsuit that forced the FDA to divulge its files on genetically engineered foods. This revealed that politically appointed administrators had covered up the warnings of their own scientists about the unusual risks of these foods and then allowed them to be marketed illegally. In organizing the suit, he assembled an unprecedented coalition of eminent scientists and religious leaders to stand with his organization as co-plaintiffs - the first time scientists had sued a federal administrative agency on the grounds that one of its policies is scientifically unsound. 5.0 out of 5 starsRecommended . As a reader of Science Fiction since the 1960's , and a nutritionally oriented person since the 1970's , I greeted Genetically Modified products with both expectant optimism and caution. As time went by it seemed my caution regarding GMO foods might be justified , but with " so called experts " giving diametrically opposed opinions , who to believe. This hardcover 418 page ( plus 82 pages of references ) is an exhaustive examination of the subject covering the subject from its' beginnings to present day. If you want to have an informed opinion on the subject this is a great source of information. I am now convinced that GMOs deserve extreme caution , and that plants engineered simply to survive increased doses of pesticides will have a negative impact on health , and backfire anyway . as they result in increasingly pesticide resistant super weeds and a build up of poison in the soil. Recommended . An amazing expose of GMOs, with a glowing endorsement by planetary hero, Dr. Jane Goodall! 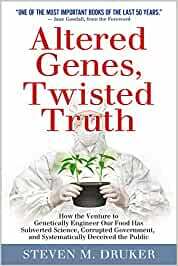 I'm reading "Altered Genes, Twisted Truth" by Steven Druker. Anyone interested in the facts behind GE or GMO foods and how they were able to proliferate globally, must read this book, based on secret FDA files on the development of GMO crops. It reads like a fast paced crime novel, but it's also heavy with facts, quotes and conversations with many eminent American scientists who dared to buck the system. The author and lawyer Steven Druker successfully sued the US FDA to have these formerly top secret documents released. In this meticulous book, with a forward by Jane Goodall, Druker explodes a host of myths and lies about the safety and efficacy of GMO foods. Druker has a sound scientific background as well. One of the shockers he uncovered was that government and Monsanto-backed scientists rammed through deregulation and fast track approval of GMOs with no objective independent safety or environmental risk studies of GMO crops, their effect in human health and long term impacts to the environment. Druker quotes a number of the world's leading scientists who were demanding safety and ecological studies before releasing alien species into the food chain, but they were muzzled and suppressed. There has been massive collusion between governments, the huge pesticide companies, agribiz and their bought and paid for scientists. I highly recommend reading "Altered Genes, Twisted Truths". You will be amazed and shocked by what you read. And you will develop a great deal of clarity and understanding on this formerly obtuse and difficult to understand technology which, with the massive use of carcinogenic glyphosate herbicide (which the GMO crops are artificially engineered to withstand), are poisoning our world and significantly diminishing the quality of life. We've got to stop this before it's too late. world as it appears to have done? When does the repair begin? true sense of the word, finding their own voices and start saying it like it truthfully is. A must read!! If you care about your food and heath, you must understand what big business/money are trying to push down our collective throats, literally! Fore warned is fore armed (with knowledge)....get it, share it. I have just started reading this book, and I am finding it very easy for a lay person to read. There is such important information in this book that I think that everyone should read this book. This book and the book "Return To Food" by Sherry Strong will help anyone make very wise food choices and life choices! the truths uncovered in this book make me wonder why we pay to be protected by the FDA since they are traitors protecting bio industry and Monsanto to the detriment of the worlds population. A must read!!! !